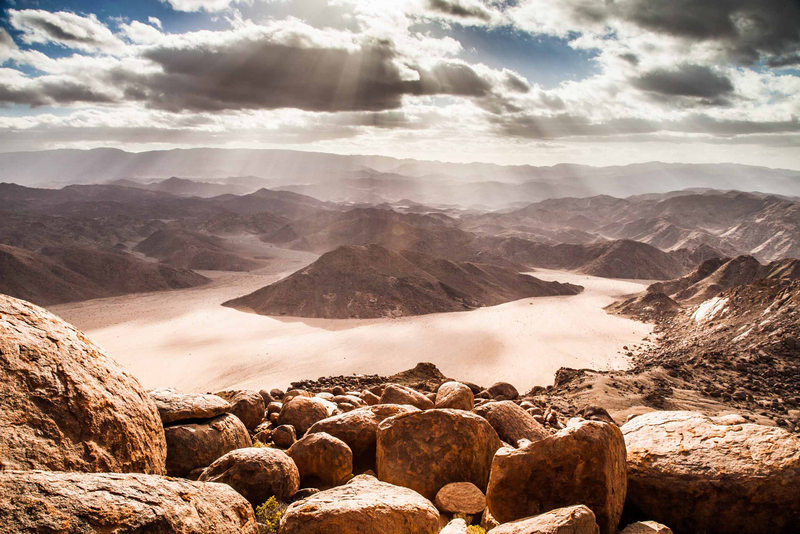 Situated in the northwest corner of South Africa, you will find the mountainous desert of The Richtersveld. To its west is the rough and cold Atlantic Ocean whilst the largest river in South Africa, the Orange River, winds along its northern border. The village of Sanddrift has breathtaking views of the Richtersveld’s natural beauty and its close location to the Orange River adds to its biological and geological uniqueness. This is a truly fascinating, culturally diverse village, and here you will hear many stories of the Wondergate (Wonder cave) and the creature that lurks within. Wondergat, or Heitsi Eibib as known by the Nama people, means “spirit” or “emptiness”. 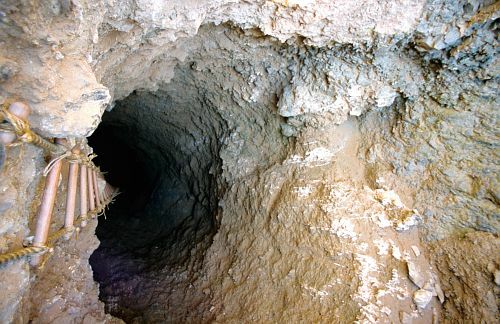 Apparently this hole connects to the sea, which is some forty miles away, and is also supposedly filled with diamonds. The Wondergat is a limestone sinkhole and has a deep shaft leading straight down into the earth. It is almost perfectly circular and about 4.5 meters in diameter. The vertical part is about 20 meters deep and the tunnel then goes much further down at an angle. This Bottomless Pit is celebrated in the folklore and mythological tales of the indigenous people. Some say the the Grootslang is a gigantic snake that leaves a trail at least three feet wide, whilst others say it’s a much more interesting half-elephant half –snake. Others say the Grootslang can transform itself into a young maiden who lures men to the Orange River to drown them, and the San believed the snake can kill with its very breath alone. 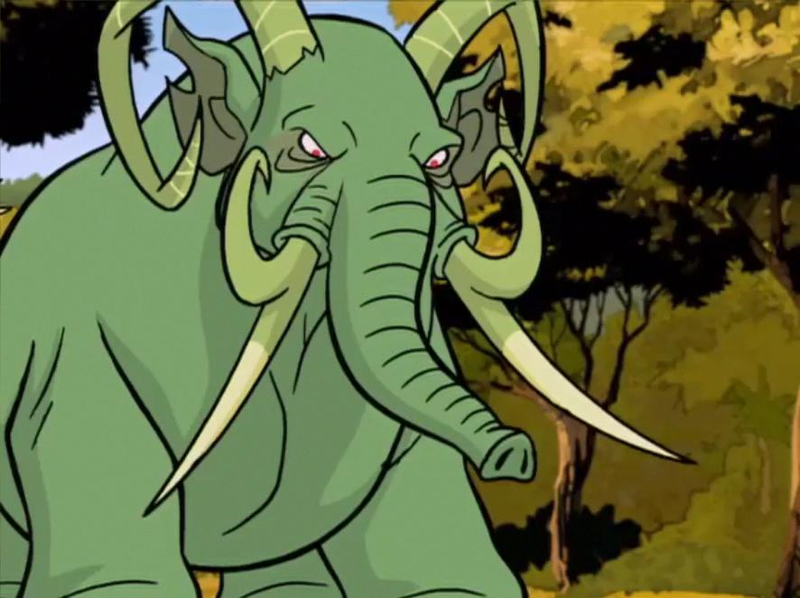 The Grootslang was featured in a “The Secret Saturdays” episode called “Something in the Water”, in it its depicted as a four-tusked green skinned Elephant with horns and a spiked snake tail. At night the Grootslang is supposed to emerge from the cave and lure prey back into its lair. It feeds on trespassers and fiercely guards a stash of thousands of diamonds and gemstones, because Grootslang coverts gems, particularly diamonds. Despite its lust for cruelty, victims may try to bargain for their freedom by offering it enough precious gems. One of the better-known stories about Grootslang centers on the disappearance of the Oxford-educated English businessman and explorer Peter Grayson. “I am determined to return to England as a very rich man or a dead man” he reportedly said before setting sail for the Richtersveld in South Africa with six companions. Then tragedy struck. On the first night in camp a lion killed one member and seriously injured another member of the team. A few days later a third person died of a poisonous insect or snake-bite. Then a fourth member of the expedition became sick and begged to return to civilization. The final two team members carried him back to the nearest town, leaving Grayson alone to continue the quest. “ I can do this on my own” he boasted before they left him. And that was the last time the unfortunate Mr. Grayson was seen or heard from. When a search and rescue party came looking for him a week later, they found the camp deserted and no sign of him. 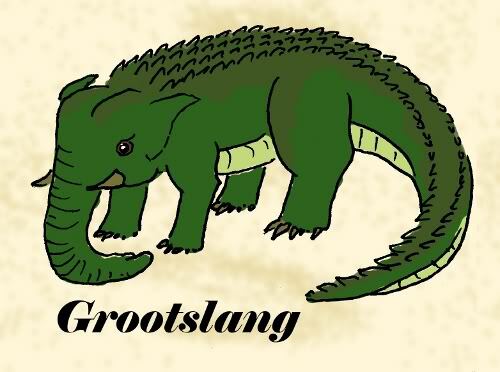 Most believe that the Grootslang got him. Modern sightings of the beast suggest that it could very well be a massive python. Eyewitnesses claim that they have seen an animal resembling a snake, at least 50 feet long. Another witness claims to have found mysterious footprints a meter wide that eventually disappeared at the edge of a river. Throughout history, many who had spent time on or near the Orange River had a story to tell. In the 19th century, a prospector called Fred Cornell had so much bother with a large snake like creature scaring his pack mules that he attempted to destroy it with dynamite. Apparently unsuccessful, he threw several sticks of dynamite into a gulley where it disappeared mid river. If this story tickles your fancy, then contact us at Road Travel Africa. You could yourself be listening to the campfire tales told by the “Grootmense” (Nama elderlies), stories which carry you away on a wonderful journey through the ages, full of wonders. You can also taste the delicious ash-bread and mutton ‘potjie’, made on the open fire, and watch the traditional Nama dancers move to Namastan music plucked on their guitars. This area is beyond fascinating, culturally diverse and myths and legends abound. There’s a diamond on offer for everyone – challenging walks in the desert, unique and beautiful succulent plants, incredibly diverse bird life, relaxing walks along the Orange River for the less fit, and the most amazing photographic opportunities.